The Dual is surely priced too low for most hobbyists to consider, the Continuum too high for all but a few hobbyists to afford. 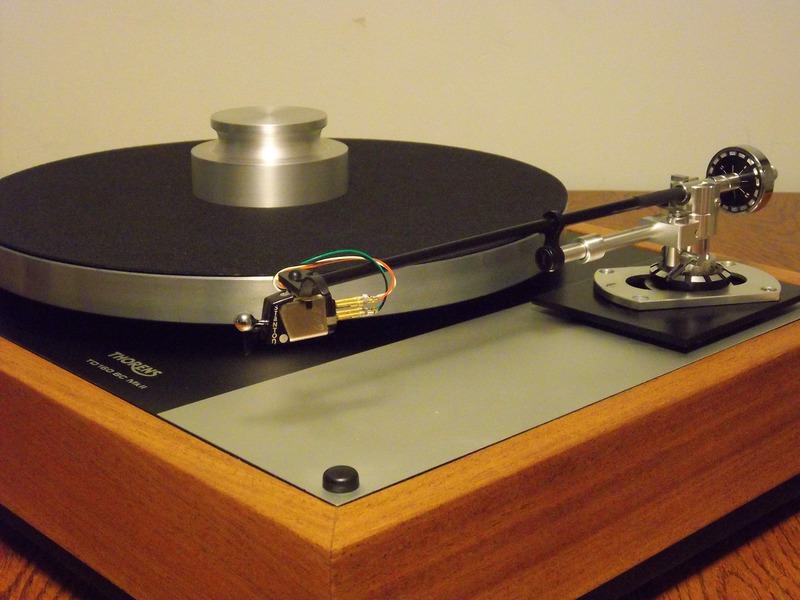 Between themand far closer to the Dual in priceis the most recent record-playing combination to cross my threshold: the Triple X turntable ($5995) and TA-1000 12" tonearm ($1995), from German manufacturer Acoustic Signature, a brand that is new to me despite having existed since 1996. Judging from their website, and from my brief exposure to their Storm turntable at this year's Salon Son et Image, in Montreal, the distinguishing traits of Acoustic Signature's turntable line are massive aluminum platters and, in most cases, similarly massive plinths; AS's tonearm line, established only last year, is decidedly less varied, comprising a single pivoting arm available in three different lengths: 9", 10", and 12". Distinct from Acoustic Signature's priciest models, whose supporting structures are all of decidedly nontraditional shapes, the Triple Xthe middle model in AS's turntable lineis built into a rectangular plinth 20.6" wide by 16.3" deep. On my review sample, the top of that plinth was clad in a striking veneer of Makassar wood, sprayed and buffed to a very high gloss, while the sides were painted in a similarly lustrous shade of black. (The Triple X is also available in a similar two-tone style of Makassar and white, as well as in all black, all white, and black and white.) An oblong armboard with rounded ends, machined from aluminum, rises 0.75" above the top surface. That structure is bolted, from underneath the multilayer plinth, to an upper level of what appears to be MDF; additional layers of MDF are included in that 3"-thick sandwich, along with layers of aluminum and steel, all of which contribute to the plinth's weight of 76 lbs without platter. At first glance, the plinth appears to be supported by three large, block-like, aluminum feet; as it turns out, the actual supporting is done by dime-sized metal inserts threaded into those blocks, and adjustable from underneath. In common with other well-known turntablesnot to mention various early mastering lathesthe Triple X's drive motor occupies a separate structure unconnected to the rest of the turntable; whether for functional or cosmetic reasons, the diameter of the cylindrical aluminum motor housing is scarcely 0.1" smaller than that of the circular opening made for it in the plinth. The motor is topped with a 1.5"-diameter pulley of black plastic, drilled through with a pattern of 16 small holes. The pulley isn't steppedspeed selection for the Triple X is done with onboard electronicsand it drives the platter by means of a thin rubber belt. Said platter, which adds another 24 lbs to the Triple X's weight, is machined from aluminum to a thickness of 1.95". An 11"-diameter area of its underside is recessed and filled with a lead-like sheet, presumably for damping. The buyer can select from one of four extra-cost platter options, all involving the use of the company's brass Silencers: precisely machined, flat-topped, cylindrical damping slugs that are press-fit into holes made for them in the platter, to absorb and dissipate the excess energy that accumulates and otherwise lingers during record play. Platters can be had with 8 or 24 Silencers, which can be gold-plated or notthe plating is said to confer a sonic benefit. Prices start at $1250 for a platter fitted with eight nongold-plated Silencers; my review sample came with the standard, unSilencered platter. Judging by appearances, the Triple X's platter bearing seems fairly conservative: a 0.475"-diameter axle with a captured thrust ball as its contact point, allied with an aluminum brass bearing well with a pair of bronze sleeves and charged with a small amount of medium-light-viscosity oil. That said, AS claims for their bearing a technological distinction: a thrust pad made of Tidorfolon, an alloy for which the company claims sufficient durability to offer a 10-year warranty against bearing failure. Supplied to me in its 12" version, Acoustic Signature's new TA-1000 is a pivoting tonearm with gimbaled bearings and an armwand comprising separate inner and outer tubes of carbon fiber, for self-damping without undue storage of energy. Antiskating bias is provided by a thread and falling weight of unique design: The thread's anchor point can be adjusted in the usual manner, and the weight's movement is restricted to an upright tube, the position of which can also be adjusted relative to that of the arm's pivot pointthus providing a range of effectiveness considerably wider than average. Downforce is static, adjusted by moving a brass counterweight fore or aft along a finely threaded axle. Arm height is fully adjustable, though not on the fly, and azimuth can be adjusted after loosening the three screws that hold the arm itself to the bearing assembly: a tricky-seeming procedure that I did not attempt to undertake. When you get right down to it, most of the perfectionist-quality turntables I've owned or singled out for praisethe Linn LP12, the Roksan Xerxes, the Pink Triangle Anniversary, the Voyd, the Well Tempered Record Player, the Ayre Acoustics/DPS, even the Garrard 301 and Thorens TD 124are actually kits. Some are packaged with the special tools and jigs required for putting them together, while entire companies have been built around the setting-up of others. What a great time to be alive. By contrast, the Acoustic Signature Triple X, the packaging for which is one of the sturdiest and most professional I've encountered, is among the growing number of record players that require little in the way of assembly: By far the greatest challenge in installing the Triple X was heaving its 105-lb bulk out of said carton and onto my Box Furniture rack. That chore was all the more challenging because the plinth had to be lowered straight down onto the motor podwith precious little room for error, as noted above. (The generally good owner's manual recommends: "Maybe ask a friend for help.") Acoustic Signature suggests that, once in position, the plinth can be leveled by means of the threaded adjustment inserts within its three blocky metal feet, but that, too, would seem to require an assistantor at least a turntable stand on which the plinth can be rotated this way and that for temporary access to the bottom of each foot, one at a time. My own strategy was to begin by making my equipment rack level, and then, before lowering the plinth into place, to ensure that the adjustment inserts on the bottoms of all three feet were turned fully clockwise. The result was a turntable that was nearly perfectly level. Installing the Triple X's 24-lb platter also required more in the way of brawn than brains. Following the instructions, I slowly lowered the platter and spindle into placemaking sure to avoid having my fingers mashed or worse in the tiny gap between platter and plinth. The bearing seemed to be free of friction, and the platter turned with no observable wobble or runout error. The only turntable chores remaining were to: install the drive belt; plug the motor's short, slender umbilical into one of two sockets on the back of the plinth; and plug the outboard wall-wart power supply into the other. Those connectors are, respectively, an RJ-45 CAT-5 plug and RS-232 plugs: odd choices, but ones that work well enough. The TA-1000 12" tonearm was similarly easy to set up, although I should note that my review sample of the Triple X arrived with the TA-1000's arm-mount collet already in place. (That said, given the very sensible design of the turntable's radially aligned tonearm board, I think that phase of the TA-1000's installation should be simple enough for anyone with an accurate ruler and access to a good drill press.) The split-ring collet, which acts as a clamp for the tonearm pillar, was easy to adjust for height, and appeared to offer good rigidity without deformation, marking, or departures from perfect perpendicularity. Less precise was the height adjustment for the cueing mechanism, which was never plumb after tighteningand so the height of the raised arm varied from the outside of the record to the inside. In common with other contemporary tonearms, the TA-1000's cartridge-mounting platform is a simple, small block of aluminum in which two (unthreaded) mounting-bolt holes straddle a central bolt by which the block is fastened to a lengthwise slot at the end of the tonearm proper. Overhang and offset angle were thus easily adjustedmy view of the cantilever and cartridge body were as unobstructed as could beand both adjustments could be locked in place with a single bolt. Making this process even easier was one of the finest brand-specific alignment gauges ever supplied with a tonearm. Looking somewhat like the black plastic pickguard of an outsize electric guitar, this two-part device snapped into place between the record spindle and the top of the TA-1000's bearing gimbal, displaying with rare clarity two Baerwald-compliant etched grids. Nice. Although the threaded counterweight was uncalibrated, the obviously high quality of its machining made it easy to adjust downforce in small, precise increments; said changes could then be locked in place by means of one or more of the counterweight's three locking screws. My only complaint: Residual friction in the vertical bearings of my TA-1000 sample was noticeably hightoo high to coax the arm into a reliably horizontal "floating" position under (presumed) zero downforce. Being of the opinion that excessive vertical friction is probably less critical with the low-compliance cartridges I usedthe Denon DL-103 and the Miyajima Premium BE Mono IIthan with very high-compliance cartridges, I was mildly peeved but did not lose sleep. I failed to get the measure of the TA-1000's lateral-bearing friction, which I usually do by alternately raising, by small degrees, the left and right ends of a turntable plinth and observing the behavior of an untethered arm set for zero downforce: The Triple X's enormous weight confounded my efforts. In use, the Triple X was straightforward. Near the right-front corner of the top of the plinth, separate LEDs for 331?3 and 45rpm indicate platter rotation, flashing to indicate incorrect or unstable speed but otherwise glowing steadily. They are straddled by a pair of pushbutton switches: one to turn the motor on and off, the other to toggle between the two speeds. Both switches are soft-touch buttons of similar appearance to the ones used in the classic Philips GA-212 turntable of the 1970s; also like the GA-212's switches, the ones on the Triple X didn't always work on the first try: Both would often respond to even a vigorous push with the electronic equivalent of a blank stare (footnote 1). Footnote 1: Lest you suspect I overstate the case: Just now, on May 21, 2015, I attempted to turn off the Triple X by pressing, firmly and unambiguously, its on/off switch. It took five tries.